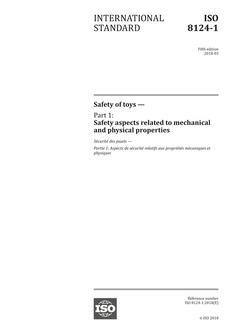 ISO 8124-4:2014 specifies requirements and test methods for activity toys for domestic family use intended for children under 14 years to play on or in. Products covered by ISO 8124-4:2014 include swings, slides, seesaws, carousels, rocking toys, climbing frames, fully enclosed toddler swing seats and other products intended to bear the mass of one or more children. Inflatable activity toys are included in the scope of ISO 8124-4:2014.